Although they’ve technically been around since the 1950s, virtual chatbots only recently became popularized, as brands implement them to reach more customers with greater efficiency. KLM Royal Dutch Airlines, for example, launched a chatbot via Facebook Messenger called “BB” (stands for BlueBot). The primary function of BB is to help passengers book tickets and keep them up to date on flight status, gate changes, and similar data-driven functions. The company built the chatbot to assist its human support team, which handles more than 16,000 customer interactions weekly, according to coverage on the MarTech Today blog. In just the first six months of operation, BB sent nearly two million messages to more than 500,000 customers. Recently, KLM expanded the reach of the chatbot by hooking it up to Google Home, adding an audio/voice layer—an interesting augmentation. I wrote about the rise of chatbots in my book, Hug Your Haters, and since then the rollout of chatbots has become even more extensive. But as I wrote about recently here at Convince & Convert, the truth is that a lot of chatbots (and live chat technologies) frustrate and disappoint customers, the very group they are supposed to aid. Despite the missteps in execution, most consumers (in all generational categories) are relatively bullish on what chatbots can do, when, and how. This became clear in a 2018 research project that surveyed more than 1000 adults in the USA, aged 18 to 64, balanced by age and gender. The survey sampling was provided by SurveyMonkey Audience, and the study itself was written and conducted by Drift, Salesforce (disclosure: Salesforce is a sponsor of my podcast, SocialPros), and myclever. You may download a copy of the entire study here—no email address required. 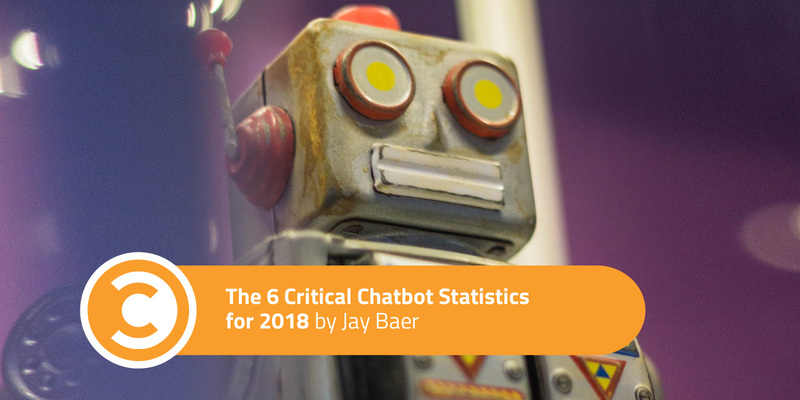 I have summarized the findings for you in this post, the 6 Critical Chatbot Statistics for 2018. Certainly, as we found in the Hug Your Haters research, telephone and email are still the most common forms of interaction between customers and companies. 60 percent of survey respondents say they have used these mechanisms to interact with a business in the past 12 months. 38 percent say they have used online chat in the prior year. 30 percent indicate they’ve used a company’s mobile app to interact. 28 percent have engaged with a business in social media. As of 2018, 15 percent of American adults (per this survey) say they have used a chatbot to interact with a company in the prior 12 months. This is almost precisely the same percentage of Americans who own a smart speaker (Amazon Alexa, Google Home, et al.) as of January, 2018 per research from our friends at Edison. 15% of American adults have used a chatbot. 16% own a smart speaker like Amazon Alexa. The survey respondents were asked what they would use a chatbot for, if available. 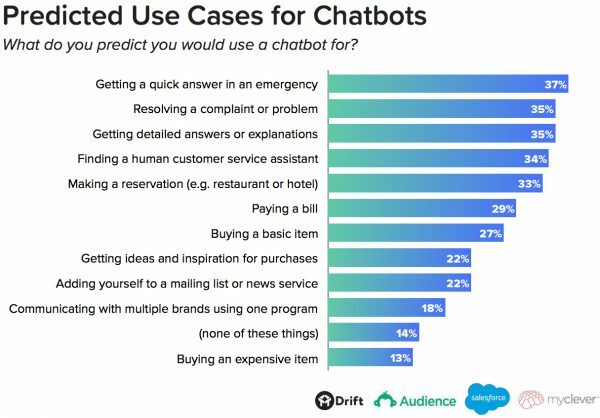 Interestingly, the most common use case for chatbots is “getting a quick answer in an emergency” at 37 percent. Personally, if I have an emergency, I’m not sure THAT’s the time I’m likely to turn to a robot for fast and accurate guidance. The second-most-common use case is “resolving a complaint or problem” at 35 percent. This makes a ton of sense, and I profiled several companies (most notably, HP) in the Hug Your Haters book that are using chatbots to augment customer service, like KLM above. Getting detailed answers or explanations is how 35 percent of respondents might use a chatbot. This is problematic today, as many of the circumstances where early-stage chatbots fall apart is in nuanced, specific requests from customers. Because chatbots—even with artificial intelligence—can only respond to what they are programmed to respond to, detailed answers are not where they tend to shine. 34 percent of respondents say they would use a chatbot to find a human customer service assistant. This one is pretty meta. If we have to use a robot to find a real person, that doesn’t say much for the capabilities of the robot, does it? 37% of Americans would use a chatbot to get a quick answer, in an emergency. Participants in this survey were also asked about the primary benefits of chatbots, provided they were available and working for the online services these Americans used most. Speed and availability are where chatbots are perceived to provide the most value to consumers. Specifically, 64 percent of respondents said “24-hour service” is a benefit of chatbots. The second most mentioned benefit is “getting an instant response,” mentioned by 55 percent of the participants. “Getting answers to simple questions” (55 percent) and “easy communication” (51 percent) were also mentioned by more than half of respondents. Perhaps unsurprisingly, “friendliness and approachability” (32 percent) are not areas where consumers believe chatbots are particularly strong. This is despite the manifest efforts of many brands to make their chatbots more “human.” Plenty of work to do in this regard, it appears. 64% of Americans say 24-hour service is the best feature of chatbots. Do you agree? This finding surprised me somewhat. The research discovered that the perceived benefits of chatbots are roughly equivalent among younger Millennials consumers and older Baby Boomer Americans. In fact, in several areas, Boomers are actually MORE bullish about chatbots’ potential that are members of the younger cohort. For example, 61 percent of participating Baby Boomers say a potential chatbot benefit is “getting an instant response,” while just 51 percent of Millennials say the same. Let’s recognize that “potential benefits” do not equal “usage,” but these findings indicate that older Americans are at least open to the premise of useful chatbots. Millennials and Baby Boomers are equally bullish on the potential of chatbots. The number one answer is a tough one for chatbots to overcome, at least for a while: our innate desire to interact with other humans. 43 percent of adult Americans say they prefer to deal with a real-life assistant, rather than a chatbot. I guess you can look at that as a half-full or half-empty statistic. On one hand, nearly half the country would just prefer to handle their business with another person. Fair enough. However, nearly six in 10 Americans do not object to using a chatbot in some circumstances. As chatbots improve, it will be fascinating to see if this objection fades away. Conversely, on the other end of the response scale, 15 percent of survey participants indicate that NOTHING would stop them from using a chatbot. That’s a high level of trust in technology! 15% of Americans say nothing would stop them from using a chatbot. In almost every case, respondents indicate they believe chatbots offer more benefits when communicating with businesses, in comparison to apps. The biggest difference is in the area of “getting quick answers to simple questions,” where 69 percent of participants say chatbots are up to the task, compared to 51 percent for apps. 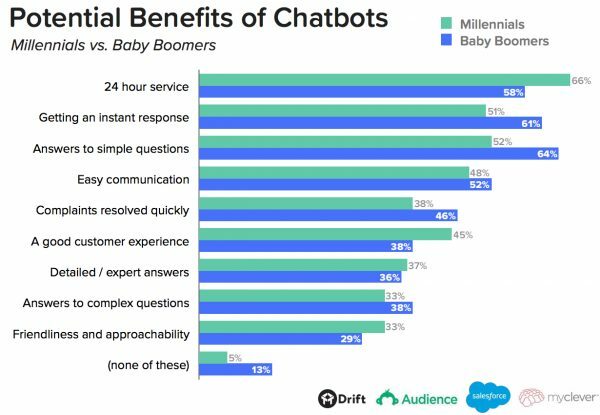 Users also believe chatbots to be superior in the areas of “24-hour service” (62 percent versus 54 percent and “ability to easily register a complaint” (33 percent versus 24 percent) among others. It’s interesting that in the circumstances where users believe chatbots to be superior, they’re FAR superior. But in the core function of easy, convenient, and customer experience, apps are perceived to be better, for now. The full study also includes comparisons between chatbots and email, and chatbots and the telephone. Compared to apps, chatbots are believed to be faster, but not as convenient. Chatbots are popping up like dandelions, and companies are rolling them out to save money and (in theory) add customer convenience. In 2018, overall consumer reaction to chatbots is positive, but still somewhat wary. This is probably wise, as chatbots will only get better as the artificial intelligence underpinnings improve, and businesses learn lessons (sometimes the hard way) about how best to utilize this new technology. If my team and I here at Convince & Convert can help you stay ahead of customer expectations in the area of email/chatbots/messaging, please get in touch about a free analysis. We create Digital Marketing Maturity Maps for some of the world’s most interesting brands, and guide them as they accelerate, measure, and propel their digital.